Single? Lonely? Looking for more commitment? Well, this chart will tell you when you’ll probably get married, based on your employment status, education, race, and gender. Created by Nathan Yau from Flowing Data, the interactive chart is based on data from the American Community Survey between 2009 and 2014. 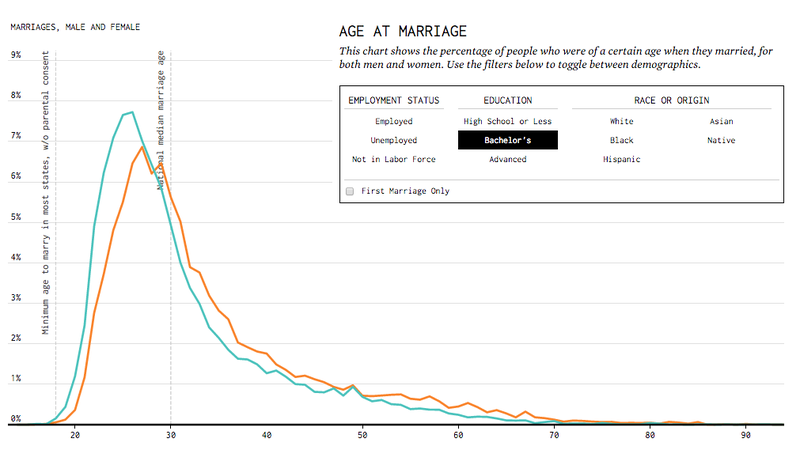 It lets you choose from a series of filters to get a better understanding of the average and distribution of age at marriage for someone of your demographic. The green line is women, the orange line men. The data shows that women marry younger than men regardless of background, but the distributions, not just the averages, are interesting. Notice, for instance, that those with a high school education get married across a broad range of ages, while those with advanced degrees seem to agree that the late 20s is the time to get partnered up. Go take a look at when you’ll get hitched.